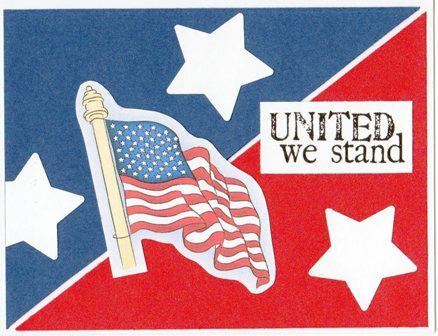 This is a super-simple patriotic card I will use to write a note to "Any Hero". I like it when a design comes easily and can be implemented in a snap! The stars look somewhat plain--should have distressed the edges or ? I've always loved a card with the split backgrounds. I do that quite often myself. I think your stars look fine just the way they are. Something I sometimes do if I feel I need a little something extra is to draw either dashes or dots around the piece. It's just a thought. Some hero will be very pleased with this one. This card definitely reads "Patriotic" and one of our hero's will be so honored to get this card. Thanks for your creativity.